Ubisoft have released another trailer for Assassin’s Creed Origins. The video focuses on on the mysterious Order of the Ancients, a powerful group manipulating Egypt in an attempt to gain divine power for their own ends. Here’s everything we know about Assassin’s Creed Origins. The Assassin’s Creed series, if you were somehow previously unaware, focuses on the unending battle between the Templars and the Assassins. But in ancient Egypt, the setting of Assassin’s Creed Origins, the assassins themselves don’t yet exist, and nor do the Templars. Instead, the game’s protagonist, Bayek, finds himself battling the Order of the Ancients. These masked figures seem to be the Templars in all but name. They’re a powerful, manipulative group who rule from the shadows and have the pharaoh in the palm of their hand. 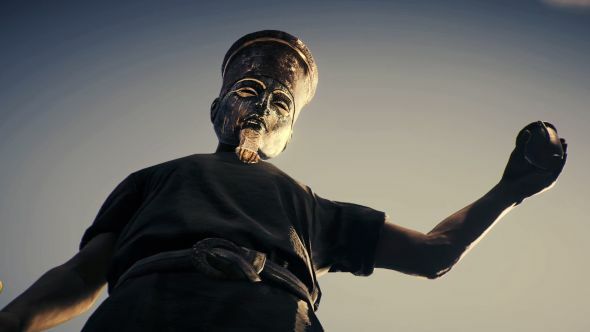 According to the trailer, the Order “seek the power of the ancient gods”, presumably so they can rule over Egypt in much the same way as the Templars seek to rule over humanity as a whole. The rest of the trailer shows off a lot of pretty stylish combat, but you can also get another look at the character dressed as Anubis, the ancient Egyptian jackal-headed god of the afterlife. That could mean that the Order succeed in their power grab. Meanwhile, we recently learned that NPCs in Origins can get stressed out, which is probably reasonable to seeing the god of death wandering around. You can check out the full trailer above. Assassin’s Creed Origins releases on October 27 for PC, PS4 and Xbox One.